Building on my book Sowing Empire (on transplantation, colonial hybridity, crossings between human and plant and between bodies and the environments on which they depend, an enmeshment which I refer to as “chimerical landscape”), I am currently writing a new two-volume book project Form at the Edges of Life. The project takes the work of art (across a range of practices and media assemblages from photography and performance to site-specific installation and multi-media spectacle) as an everyday laboratory for the development of a situational ethics. The project proposes an engaged formalism as a vital means of addressing the ethics of aesthetics in global contemporary art practice. In the vulnerable situation of necropolitics or life exposed to the power of death, art practice, I suggest, offers experiments with aesthetic form as ways of reckoning with the posthuman situation of death-in-life. The first volume, Necrolandscaping, anatomizes what I call the “labors of care” that, in the austerity state, become the affective work of art practice. The book proposes a new mode of ethical engagement in contemporary art practice that moves beyond the limits of what is considered livable life and grievable death in order to imagine other scenes of care. Through art practice that takes the scene of dying as tactical and often intimate responses to global necropolitics, the book develops what I call “pyrography.” Pyrography refers to the “as if” work that art can perform in affording virtual spaces for trying out the possibilities of death as something other and more than the negative end of life. The second volume, Chimerical Landscaping, intervenes in the roiling public debate over transgenic politics—from genetically engineered “kill seeds” to stem cell transplantation—by repositioning how we apprehend hybrid manifestations of biological life. The book works through the mattering consequences of the living figure of the chimera. The fire-breathing, multi-headed lion-goat-serpent of Greco-Roman mythology is now the scientific and legal term for all biological entities with more than one set of DNA. The living metaphor of the chimera matters consequentially for medical research and public policy in tethering transgenic life to the teratological specter of hybridity. The chimera incarnates the hybrid as not only monstrous. Figuring hybridity as inherently destructive, the chimera marks the death of the human in presenting transgenic life as not just posthuman but also inhuman. At the same time, the book demonstrates across a set of contemporary art practices that chimerical figurations of materializing transgenic imagination are also forms for emergent possibility in their negotiation of the mess of mixture. In their transformations of form, chimerical figurations in art practice are the starting points for an ethics of care not of the self but for the radical changes that have already occurred, that is, for the current condition of death-in-life. Crossing the history of psychoanalysis, media history, the history of scientific method, and the history of colonization, Scenes of Projection poaches the prized instruments at the heart of the so-called “scientific revolution” (the projecting telescope, the camera obscura, the magic lantern, the solar microscope, and the prism) to make the audacious argument that, in the wake of colonization and from the beginnings of what is retrospectively enshrined as the origins of the Enlightenment, the scene of projection has functioned as a pedagogical contraption for producing a fantasy subject of discarnate vision and the exercise of “reason,” that is, as a shaping instrument and machine of not just psychic but also material production. As an apparatus that produces its subject, the scene of projection is neither a static diagram of power nor a fixed architecture but, rather, a pedagogical set-up that operates across a range of sites as an “influencing machine” of persistent training and repetitive exercise. If the scene of projection is not to be a machine for the production of a flattened terrain for the fortress ego that seeks to remake the world in confirmation and consolidation of its disavowed vulnerability and susceptibility, the scene of projection is necessarily also a scene for doing history for a different future, an apparatus for producing an opening by the tracing of the belied connections in and across precisely those scenes of projection that might seem not only disparate but disavowed in relation to what would seem their geographic, cultural, or temporal place--that is, the queerly disorienting, the anachronistic, the minor, the backward, the ostensibly surpassed, or the better left behind. Scenes of Projection thinks projection as an apparatus of power for the production of the subject in terms of a psychoanalytic understanding of history as a task of analysis and writing, one that understands history as at once the haunting trace of the disavowed in the scene of projection and a practice of re-charging the contacts of foresworn connections and forsaken passionate attachments, including those between the scene of psychoanalysis and the scenes of the use of projective devices in pedagogical demonstration lectures and scientific experiment. The movement within the chapters and the larger arc perform a back-to-the-future movement, shuttling between times and geographies as it thinks psychoanalytically about the complex, dialectical capacities of projection, that is, as means to produce the illusion of the impervious subject of rational vision and ways of thinking the abjured and the trace as shadow-histories or archives within the scene of projection as apertures for an opening onto ways of becoming that are imminent in the scene. This reevaluation is carried across five chapters, each of which is dedicated to relating a particular modality of psychoanalytic projection and the complexly allied process of introjection (paranoid projection, morbid projection, introjection, the “shadow of the object” cast across the ego in melancholia, and imaginative projection) to specific devices and techniques of projection (the camera obscura, the magic lantern, the phantasmagoria machine, the solar microscope, the prism, ingesting automata, spirit possession, shadow-casting, and prismatic projection) across scenes that traverse as they connect centers and ostensible margins, metropole and periphery. With globalization steadily reshaping the cultural landscape, scholars have long called for a full-scale reassessment of art history's largely Eurocentric framework. This collection of case studies and essays, the latest in the Clark Studies in the Visual Arts series, brings together voices from various disciplinary and theoretical backgrounds, each proposing ways to remap, decenter, and reorient what is often assumed to be a unified field. Rather than devise a one-size-fits-all strategy for what has long been a divided and disjointed terrain, these authors and artists reframe the inherent challenges of the global—most notably geographic, political, aesthetic, and linguistic differences—as productive starting points for study. As the book demonstrates, approaching art history from such alternative perspectives rewrites some of the most basic narratives, from the origins of representation to the beginnings of the “modern” to the very history of globalization and its effects. 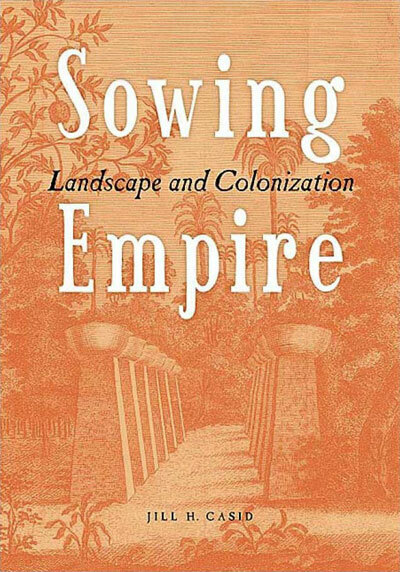 Sowing Empire reconsiders the Georgic as discursive and material practices of imperial relandscaping through which particular formations of family, nation, and colonial empire were engendered and naturalized but also how these discursive and materials practices contained within them the seeds for resistant re-versings. A study that treats landscaping and transplantation between England, France, and the West Indies as discursive and material technologies of empire, the project is distinctive in its methodology (drawing on and revising Foucauldian discourse studies, postcolonial work on hybridity and transculturation, and psychoanalysis), its geographic and historical range, and the scope of its materials (encompassing, in its analysis, colonial plantations, survey maps, natural history texts, travel literature, picturesque European gardens, the imaginary gardens of bestselling novels, and paintings). The book explores one of the main material ways in which what we take as "European" was produced out of the history of colonialism. The book examines material traces of transplantation but it also gives careful consideration to cultural strategies of dislocation and displacement in efforts to produce the illusion of the autarchic and the pure. The book is divided into five chapters that move topically from consideration of transplantation and hybridization as techniques of imperial landscaping in the sugar plantation in the West Indies (chapter 1), the picturesque landscape garden in Europe (chapter 2), and the imaginary island-gardens of fiction (chapter 3). The last two chapters focus on the problems of difference and resistance, one on queer counter-versions of imperial Georgic landscaping that, nonetheless, also functioned as self-inscriptions and a last chapter on slave gardens and slave revolt. The plantation machine imposed on the islands of the Caribbean by the Spanish and then the French and British was a system of signs as much as a mechanism of economic production and exploitation. The prospect of the colonial landscaping of the plantation-machine was also always appropriatively prospective: power in the future anterior of the what will be.